After 32 years of void, the Datsun brand is being revived and we, Indians, should feel privileged that Nissan is introducing the brand to our country first. Basically, Nissan is targeting up-and-coming aspirational customers of the emerging markets with their new sub-brand. India being the rising country for such audience, what better place than here and what better time than now for Nissan to gather huge volumes? So the first Datsun to be launched after the brand’s revival is the GO. Yes, the name sounds offbeat but it’s derived from the first Datsun, Dat GO, launched in Japan in 1914. The Datsun GO hatchback intends to be affordable yet practical at the same. We explore the car in detail to find out whether the entry level hatchback makers have something to worry about or not. Motor Quest: The Datsun brand had originated in 1914, when a Japanese automaker Masujiro Hashimoto founded the Kwaishinsha Motor Car Works in 1911 and produced its first car, called DAT. DAT was an acronym of the company’s investors’ family names. The company was gradually renamed and finally became Datsun in 1931. Nissan phased out the brand in 1986 and it has now been revived. 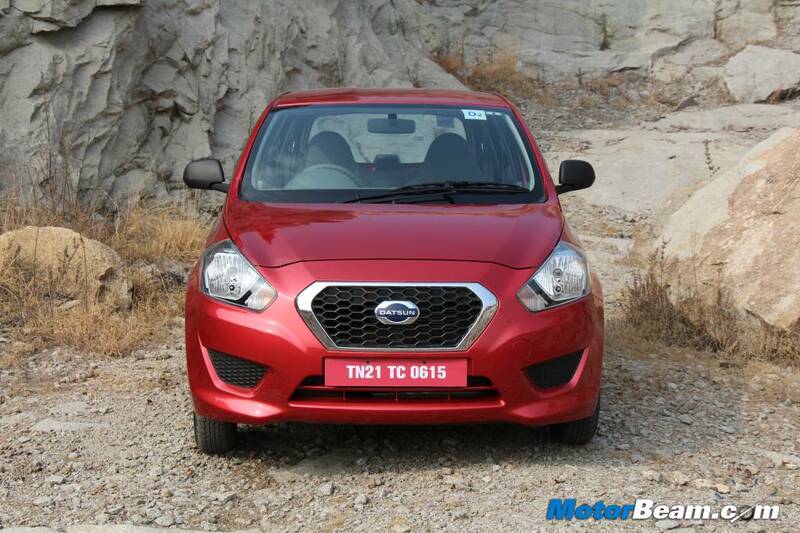 Exteriors – The Datsun GO looks upmarket and fresh, considering the targeted entry level hatchback segment. Nothing is quirky in its design language and it looks well balanced from every angle. The GO looks sizeable based on the Nissan Micra’s V-platform. The front end is sharp and broad, where the most attractive bit is the diamond shaped Datsun grille. Every element at the front such as the bonnet lines, big headlamps and heavily sculpted bumper is pointing towards the large grille. The only plaque in the teeth of the GO’s front styling is the unusual single wiper. The side profile is neat, where the shoulder line and lower crease run smoothly across the body. The shoulder line merges with a power bulge at the rear door that continues to the tail and gives the GO a good presence. The blacked out B-pillars reflect a good contrast with the body but the big wheel arches and small 13-inch tyres looks wacky from the side. The rear of the Datsun GO is tastefully done as well, having an angular rear windshield with squarish tail lamp cluster and chunky bumper. Nissan has emphasised on the Datsun logo at the tailgate sitting on a bulge. 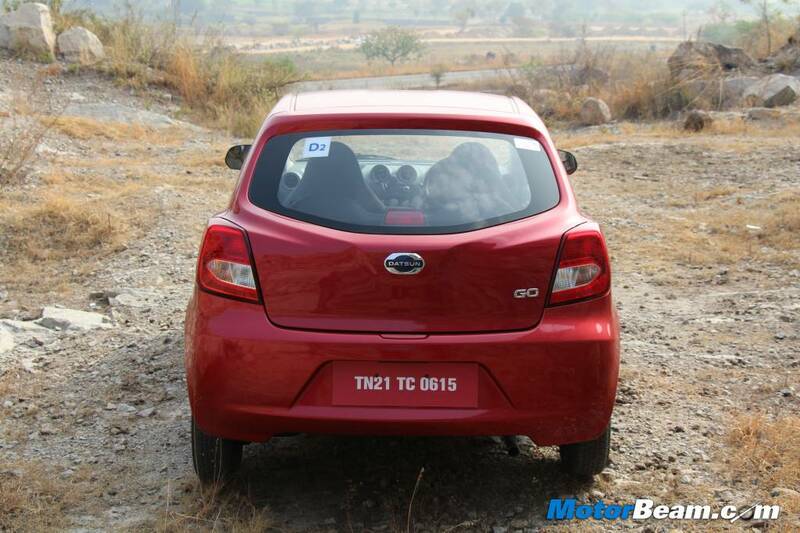 Interiors – The interiors of the Datsun GO are not really exciting after examining the mature exteriors. There is this ordinary and basic feeling which you get out of the dashboard when you enter the cabin. The light colour tones are used well though, giving a sense of good space. The seat fabric includes Jacquard finish on the top of the line variant, while others have plain finish. The dashboard uses dual tone beige colour with a black central console. The steering wheel feels good to hold, which is a three spoke unit with a big horn pad (but the horn has a monotone). The instrument cluster is simple and easy to read, which has a gear shift guide on the speedometer. There is a small LCD digital screen below the speedometer that displays tachometer, fuel level, instantaneous fuel consumption, average fuel efficiency, trip computer and distance to empty. Performance – The Datsun GO is powered by a 1.2-litre, 3-cylinder petrol engine, which is derived from the Nissan Micra but is de-tuned and produces 68 PS of power at 5000 RPM with 104 Nm of torque at 4000 RPM. The GO is light, weighing 769 kgs and produces relatively high performance figures compared to its rivals. This recipe makes the performance peppy and fairly quick. Remember the rapid initial acceleration of the Maruti 800? Same is the case with the GO but in a much smoother and refined manner that stretches up to the northern side of the mid range. The Datsun GO can do 0-100 km/hr sprint in just 14 seconds, which is remarkable. This peppy nature of the 3-pot motor makes it easy to shoot the car in gaps precisely and you would find it very easy to drive around town. Now you get past the mid range and are about to touch the redline (which comes in early at 5200 RPM), this is the zone where you would feel the engine lose steam and strain a bit. However, compared to the rivals, power delivery is mature and the engine doesn’t struggle to gather speed. Even with the AC on and three passengers sitting with some luggage in the boot, the GO feels at ease. The downside of this 3-cylinder engine is that it vibrates at idle and that’s evident but once the revs build up there are no such vibrations. The engine sounds quite nice for a 3-cylinder unit. The engine’s highway response is worth appreciating, as it keeps the car on charge at high speeds and doesn’t feel as if it is being pulled. The Datsun GO can manage to touch 165 km/hr but it feels fairly controllable between 120 – 130 km/hr. Mated to the 3-cylinder 1.2-litre petrol is a 5-speed manual transmission that feels little notchy but slots into the gates easily. The ratios seem to be well spaced out and in gear acceleration is good. At 100 km/hr in fifth gear, the tachometer hovers around a calm 2500 RPM, so you can imagine its cruising ability at highways. The hydraulic pressure type clutch is light to use and maintenance free compared to the lever type conventional clutch. The Datsun GO returns an ARAI claimed fuel mileage of 20.6 km/l but in real world conditions expect it to be around 15 km/l ballpark. 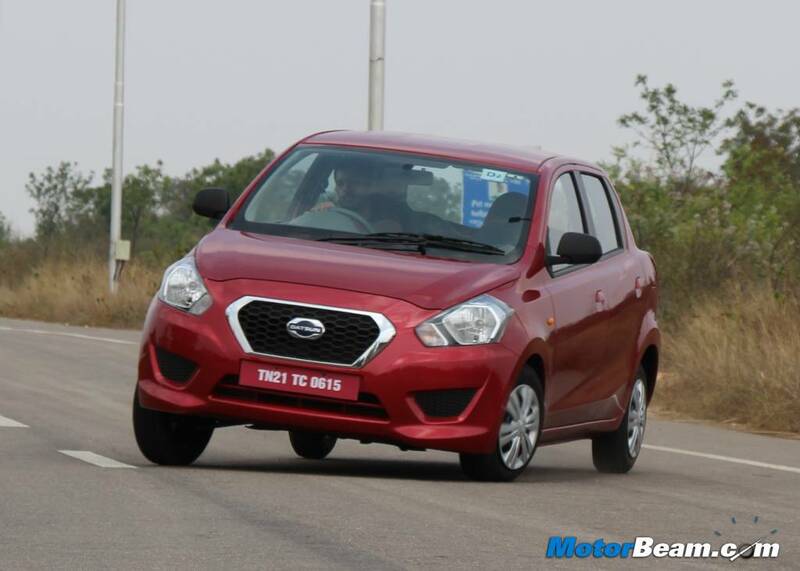 Driving Dynamics – The Datsun GO is based on the Nissan Micra’s V-platform, which is known for good handling and ride. The ride quality is amazing and unbeatable by the rivals. It feels a few segments above its class. The long travel of the suspension and linear damper makes the ride flat in most conditions but on really bad roads, the suspension gives that thumping feeling. Now because of the long suspension travel and small tyres the body roll is pronounced, otherwise the handling is good and it responds well. The electronic power steering has torque sensing motor and it is speed sensitive, so the feedback is linear. Safety – The Datsun GO doesn’t come with ABS and airbags, not even as an option on the range topping trim. This comes as a surprise, considering the fact that Nissan is offering the Micra with driver airbag as standard across all variants, even the Micra Active XV S comes with driver and passenger airbag along with ABS, EBD and BA. After the Global NCAP tests of some Indian cars, the awareness of safety aspect on cars is growing amongst Indian buyers. Nissan should consider offering ABS and at least a driver side airbag as an option if not standard equipment on the Datsun GO in the near future. Verdict – The Datsun GO is being targeted at first time car buyers in India and if you are one of them, you will notice that your checklist tallies all the right boxes with the GO. Nissan’s new entry-level hatchback is big in size and has smart styling cues that will make you give it a second glance after parking it. It has ample amount of space to accommodate five people and good load of luggage with ease. The GO offers some smart features while keeping the costs in check. The frugal yet powerful engine along with the mature suspension setup makes driving easy and comfortable in city as well as highways. Yes, cost cutting is evident and it lacks the necessary safety features but at the end of the day, it’s offering huge bang for your buck and is a tough nut to crack in this segment. The Datsun GO can be a game changer in the entry level hatchback segment by offering almost everything that a first car buyer expects but additional safety features would have been appreciated. The Datsun which is a Nissan and the Nissan which is a Renault, confusing eh?